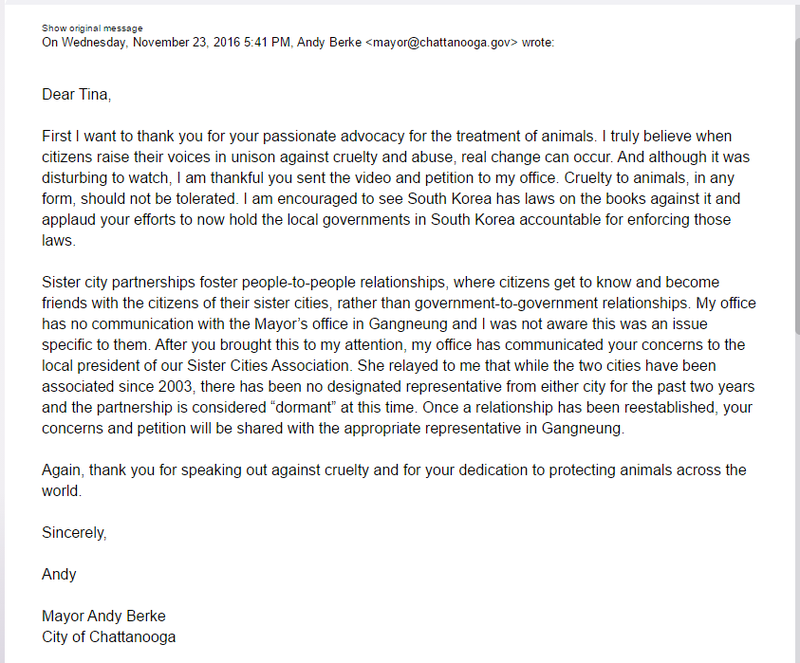 Andy Berke, Mayor of Chattanooga, has replied to our Gangneung Sister City campaign/petition that we sent to his office (see below), and we are pleased to say that he has responded positively. He feels the same as we do about the need to address any animal cruelty issues, and was grateful to us for bringing this matter to his attention and for sending the video, which he found disturbing but, importantly, did watch. Chattanooga now has an opportunity of re-establishing their dormant Sister City Relationship with Gangneung, and Mayor Berke has said that, at that time, he will take the matter up with them. We can sense Mayor Berke’s willingness to help in this issue and we would like to thank him and the members of his office for their kind words, and for listening to our concerns and taking action. I would like to thank you and the City Council of Chattanooga for responding to our concerns raised via the recent petition on Change.org about the mistreatment, torture and consumption of companion animals in Chattanooga’s Sister City Gangneung. Both domestic and international pressure on this issue is required if we are going to incite some real change in South Korea, so I kindly urge that, having re-established your dormant Sister City Relationship with Gangneung, you reach out to them until affirmative action has been taken by their authorities to end the horrific and illegal practice of the dog meat trade for good. Mayor Andy Berke and City Council of Chattanooga, thank you for a positive response in fighting against the cruel and vicious slaughter of dogs and cats in South Korea. I am a teacher in California and will let the parents and children know that there are good people fighting for the voiceless. Please contact Congressman Hastings of Florida. He is trying to stop Yulin in China and the Dog Meat Slaughter in Asia. Both domestic and international pressure on this divisive issue is required if we are going to incite some real change in South Korea, so I kindly urge that, having re-established your dormant Sister City Relationship with Gangneung, you reach out to them until affirmative action has been taken by their authorities to end the horrific and illegal practice of the dog meat trade for good. Dear Mayor Andy Berke and City Council members, having received a positive response on my personal email with regard to your sister city status, I’m impressed by your commitment to this cause. Thank you again for making a difference. Thank you for your positive response to the petition calling for the end of the dog and cat meat industry. Having those in positions of authority stand with those who care about the welfare of these innocent animals is a big boon to this cause. Thank you in advance for your willingness to discuss this with the leadership of your sister city. Hopefully, they will be as amenable to work towards putting an end to this reprehensible practice once and for all. Thank you Mayor Andy Berke of Chattanooga. Thanks to this WORLDWIDE PETITION, the world is finding out that you listened to the people and watched the horrible video showing how cats and dogs are slaughtered for food in South Korea. We hope that Gangneung ,Sister City, will also co-operate. Dear mayor Andy burke and council, Thank you so much for supporting this cause. Thank you so much. Those poor animals are caught in a Korean HELL. We all need to do our part to stop them. God bless you and all your staff. Thank You from the bottom of my HEART for speaking out for the voiceless! I pray everyday for this to end in all the Asian countries and nott only in Korea. Thank you for caring for these poor animals mayor! They thank you. It’s unfortunate that more politicians don’t care.